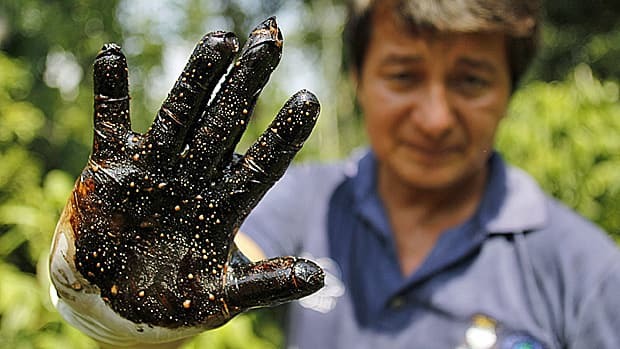 I listened this evening to part of CBC’s story about the $18 billion dollar judgement for pollution in Ecuador that Chevron is still fighting. As a representative of the indigenous Ecuadorans discussed the lack of environmental controls in place at the time, and the huge legal challenges that they had had to go through to even get the case heard, it struck me that perhaps one of our problems is that we forget that corporations are people. Not in the sense of Corporate Personhood, but that every enterprise, organisation, business or corporation is made up of individual human beings. ‘Chevron’ may be refusing to take responsibility for the ecological disaster it has created, but this is merely the aggregate behavior of a group of individual employees. Forty years ago real, living, breathing people decided that an Ecuador drilling operation didn’t need the same environmental safeguards that would be required in North America. Today, real, living, breathing human beings will get up, eat breakfast, and then go to work on drafting legal arguments explaining why no further effort needs to be made to clean up the mess created by the dumping of 18 billion gallons of oil-contaminated water. The ‘limited liability’ nature of the modern corporation may well legally protect shareholders and executives from unlimited prosecution, but it cannot protect them morally from culpability for their actions. Rather than just talk about Chevron, or any number of other ethically-challenged corporations, perhaps we should talk about the real human beings who made and are still making the decision to treat the lives and livelihoods of those around them with contempt. Posted in Politics on May 31, 2012 by trevor.